Heidi & Hudo; On the Road Again! Heidi’s SPOT tracker and her Instagram show her traveling to Arequipa this week. 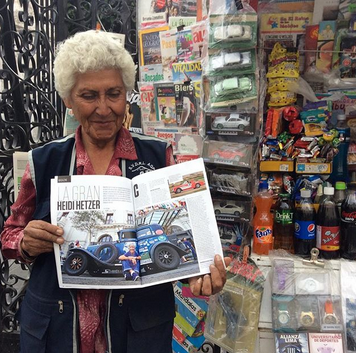 We are happy to see her and Hudo back on the road again in their epic quest to drive around the world. Note:Heidi Hetzer is a 78-year-old former automobile dealer, rally car driver, classic car collector and popular celebrity in Berlin, Germany. She is currently circumnavigating the globe in a vintage 1930 Hudson Saloon. Mongo and Dad have already begun to notice the heralds of Spring, and it’s not even March yet. If Heidi is in Germany; Where Is Hudo? While Heidi’s fan base awaits news of her repairs back in Germany, the question has been raised as to the conditions of Hudo’s accommodations. While the first reports on Heidi’s trip back to Germany only mentioned that Hudo was being put into storage, further reports indicated that Hudo is enjoying luxury accommodations amidst other notable automobiles at the Museo de Autos Antiguos Colección Nicolini. Mongo is a talented dog, and his problem solving abilities are quite impressive, at least when it comes to solving problems related to getting more food. This morning, as Dad and Mr. M walked past a neighbor’s driveway, Mongo locked up in a point. Normally, this posture is reserved for birds, squirrels, cats, etc. However, when Dad looked to see what had caught Mongo’s attention, nothing jumped out at Dad, literally or figuratively. Dad scanned the area for a moment. Then he realized what had caught Mongo’s eye. 98% of the Pilot Bread is sold in Alaska. However, Drewbie found some in a local market in Northwest Washington State. He decided to surprise Dad by bringing some home. Back in the day, Uncle Marc and Dad had feasted on hardtack from K-rations whenever Grandpa came back from maneuvers. Canned eggs and ham, hardtack, and waxy chocolate were among their favorite eats. Another one buddy”, Dad asked ask he scooped up another pile for this morning’s walk. Dad knew something was amiss with Mongo. Mongo is typically a digestive machine. Two cups of kibble every morning and night yield one bag of dog poop every morning and night. But here was Dad in the cold light of a winter’s dawn making multiple scoops. For some reason Mongo was off schedule. The evidence was that Dad was on his third baggie of the morning. His first thought when Mongo hunched up the second time was that Mongo had one more piece to poop out, a Clingon if you will. That has not been the case. Instead of one more little turd, Mongo had made an entire second load. And when he finished the second load, he had started a third.